This week privateer press unveiled some neat stuff. 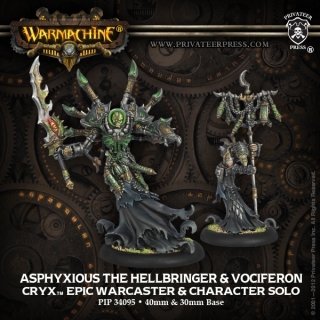 The Asphyxious3 model is the first level 3 caster to have a model! And a cool model it is. "More than one thousand years of preparation has brought Asphyxious closer than ever to his goal of rising above the other lich lords to stand as Toruk’s most invaluable general. He alone holds the key to unleashing the terrible might of the Nightmare Empire. To aid him in his great work, Asphyxious has applied his impressive mastery of thrall runes to craft Vociferon, a skarlock perfectly equipped to serve as a conduit for souls. Vociferon’s battle standard of death and discord resonates with unholy intent, for it was made to collect the essences of all who perish within its reach and fuel Asphyxious’ fell sorceries." 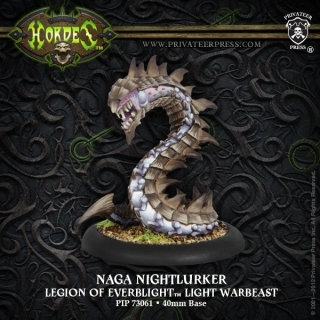 "As the hosts of Everblight’s legion advance, they are preceded on the ground by the fearsome naga. These draconic horrors first spew caustic venom upon their victims before closing to tear the wounded apart with fanged maws. Though seemingly simple in form, the naga are in truth complex spawn representing Everblight’s genius in the manipulation of blighted flesh." Kind of a grand description for a medium warbeast. But from what I can dig up, this guy might actually be pretty boss in a warbeast heavy list. His animus gives magical and blessed but I'm not sure of the range. On melee crit, he does shadow bind which gives -3 def. Depending on the point cost and the range on his animus, I might be picking this guy up.